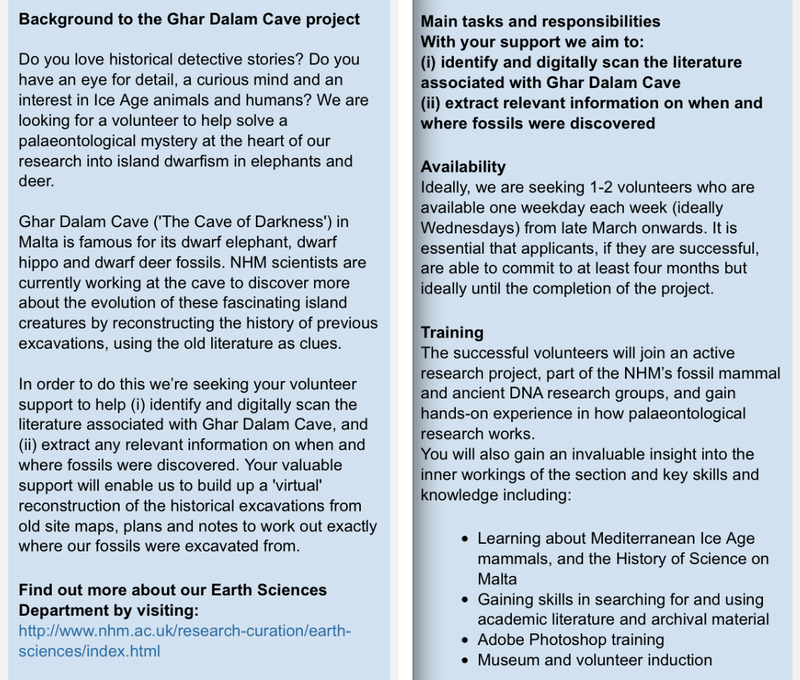 I’m recruiting a volunteer to work with me at the Natural History Museum, 1 day a week (preferably wednesday) for approximately 4 months, to help piece together the excavation history of Ghar Dalam Cave in Malta (a key site for Pleistocene insular dwarf elephants, hippo and deer). It would suit someone with an interest in palaeontology and evolution, and also an interest in the history of science. You must be able to read and interpret maps and diagrams of stratigraphical sections. Applications & enquiries must be made via the NHM recruitment system. To apply, follow this link [NHM Jobs], and then select ‘Cave of Darkness’ for my project.